WARDEN — They sat at the table as the crowd started gathering, like Carrie Underwood and LeAnn Rimes signing autographs, just a couple of rockin’ country girls with ball caps pulled down tight, waiting anxiously as the foyer of the Warden gym started to fill up Thursday night. Bailey Whitney and Aubree Skone have been playing soccer together since they were little kids, the jerseys lined across the glass case housing the Warden Cougar was a nice tribute to the days leading to this moment. The Cougar jerseys in the center recognized two of the best 1A players in the state. Whitney, the SCAC East player of the year, was second team all-state. Her running mate, Skone, was all-state honorable mention. Now they’re going to be on opposite sides of the formation. 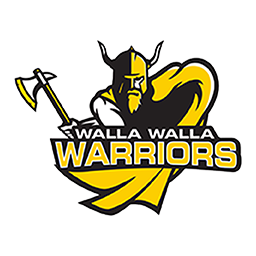 Whitney signed a national letter of intent to play at Columbia Basin College in Pasco and Skone inked a deal with Walla Walla Community College. But Thursday night, in front of friends and family, they were Warden Cougars and blue was the color even though both were decked out in their new college jerseys. Skone is a striker that’s going to play for Jordan Hacker, who directed the Warriors to the NWAC East Region Championship (18-1-1) last season. 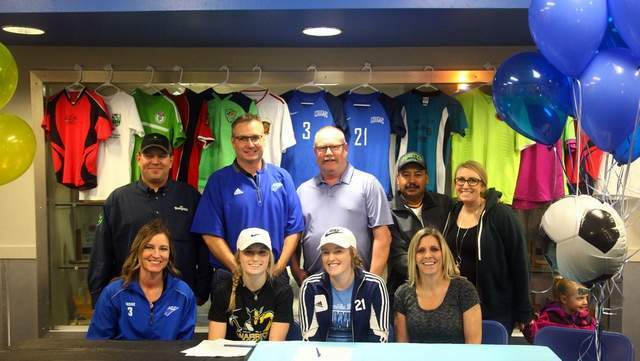 She’s one of the most prolific goal-scorers in the Columbia Basin and now she’s going to test her skills at the next level. “I’ve played club ball at Wenatchee and gone as far as Kennewick to play on a team down there, so playing with different players with a better skill set won’t be anything new,” said Skone, who will also compete on the Walla Walla rodeo team. “There’s a lot more to being a forward that just putting the ball in the net, there’s working together to move the ball around, passing, moving without the ball. Whitney will join Omar Anderson’s roster at Columbia Basin College. Anderson, who’s originally from Kingston, Jamaica, was the 2018 NWAC East Coach of the Year, directing the Hawks to a 8-3-5, 6-3-5 NWAC East record. She’s expected to play center-midfielder at the collegiate level. “Playing in college, I know the girls are going to be a lot stronger with better skills,” Whitney said. “I’m going to have to move more than I did in high school. Skone, who also competed at the National High School Finals Rodeo in Rock Springs, Wyo., in goat-tying, plans to be a high school guidance counselor. She’ll work on her associate’s degree and juggle her time management between college soccer and college rodeo. Whitney intends to get into nursing. She’ll fill her schedule with science and pre-med classes with the intention getting into nursing school down the road. For the long-time teammates who’ll be college adversaries, on the field anyway, it’s an exciting twist in separate journey’s. “I plan to sit at midfield and root for both girls,” Aubree’s mom Cassie Skone said.